Why is Upload Speed Important? All ISPs (Internet Service Providers) tout their “download” speed . . . but very few ISPs even mention their “upload” speed. Should you conclude then, that the “up” or “sending” speed is not very important? An important part of all communication is acknowledgement that the message was received. In all conversations, knowing that the message was received is as important as sending the message. Humans look for some small voice or body language acknowledgement that what we are trying to communicate is being received. Otherwise, the same message is just re-sent again and again (we keep talking), until an acknowledgement is understood or we just give up. The more sending and receiving occurs in a balanced fashion, the more rewarding, or complete, the conversation is considered. The Internet works exactly the same way. Satellite-based Internet suffers from the delay, (or lag, or latency), of long distance acknowledgements. It is far superior to dial-up, and it is very good at streaming a continuous amount of data, as long as it gets some idea that it is being received. It is not very good at interactive connections, which is why most web sites and gaming devices don’t seem to work very well. Internet based music streaming does not work very well. Satellite-based Internet can be had almost anywhere, it just should not be your first choice if you have a choice. Telephone Company copper wire based DSL Internet connections were a vast improvement over dial-up connections. It uses the same copper wire that have been used for the last 100 years, it just uses different kinds of equipment on each end, in this case, digital signals instead of audio signals. It worked great, but it is limited in the speeds and distances that it can reach. The Digital Subscriber Line (DSL), came into the market just when we were all moving from a single desktop PC to multiple desktop PCs, then Laptops, then Notebooks, now iPads and Smartphones. DSL was great for a single device but is not as efficient if you have multiple devices in your home or office all using the same network, because they all need their piece of the “up” connection. DSL was not designed for today’s Internet. 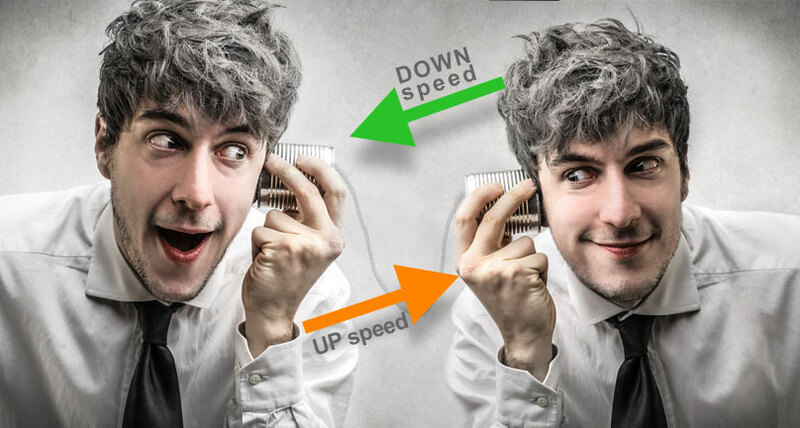 There are symmetrical, (same speed both ways), connections which are more expensive than the normal asymmetrical (more download and less “upload” speed) connections. These connections are normally what server computers use to send Internet content like email, video, and voice to us. The Internet is a two-way communication process, and is much more interactive and participatory than it has ever been. That means that we are “sending” more and more “up” to the Internet, or the “Cloud,” than ever before. In fact, things as simple as email or word processing programs are becoming more and more “Cloud” based. This requires more balanced connections if we want to use them efficiently.We have more devices than ever before, and they all need their piece of the connection. 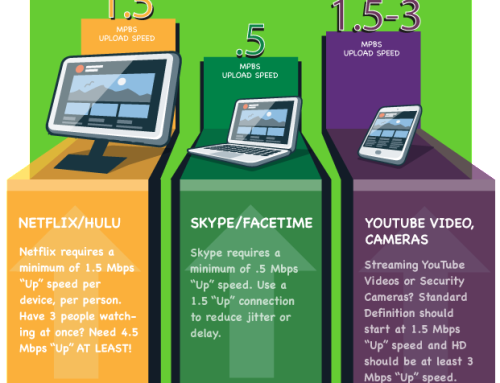 The more devices you have, the more download and upload speed you need. Netflix: Requires 1.5 minimum (the more the better). Have 2 or 3 people watching Netflix at the same time? You are looking at a minimum of a 4.5 “up” connection. AT LEAST! So if you are dissatisfied with your Internet results because it runs slow, or lags, even though you might have a 6-15 Mbps download plan, it is probably because your “up” speed is low. GoBrolly® offers several plans with unsurpassed “up” speeds at an affordable price. While download speed is the most important factor in broadband service, it’s not the only factor. Depending on the activities you do online, you may also want to pay attention to Upload speed. This is the speed at which you can send information from your computer or device to the web. It’s especially important for video conferencing, sharing larger files online, interactive learning, medical applications that use HD imaging, and two-way online gaming – as well as advanced “cloud computing” that involves ongoing communication between your computer and the web. Ideally, all of these applications would work best if upload speed were as high as download speed, but service providers generally don’t offer that option. Brolly Blogger2018-03-28T12:43:57+00:00December 1st, 2014|Categories: Upload Speed|Comments Off on Why is Upload Speed Important?